Sorry... the 2017 Toyota 4Runner is no longer being sold as new. Instead, take the first step to a great deal on 2019 Toyota 4Runner with a free price quote! 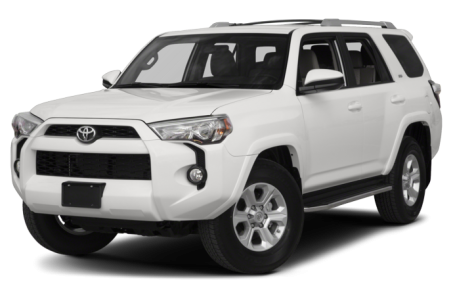 The 2017 Toyota 4Runner is an old-school SUV, sticking to a tradition box-on-frame design and offering better off-road capability and ruggedness than you will find in any of the new wave crossovers that have taken over the streets. Six trims are available: the SR5, SR5 Premium, TRD Off-Road, TRD Off-Road Premium, TRD Pro, and Limited. The 4Runner looks the part with its large fender and upright stance that hint at its prowess. Up front, the fascia is busy, with lots of nooks and crannies built into the body work that surround a large front grille opening. 17-inch alloy wheels come standard, with larger wheels up to 20-inches in size available. Fog lights, projector headlights, and a power window in the liftgate are standard. For those who want even more rugged looks, a TRD Pro Series trim is offered which gets unique wheels, all-terrain tires, a front skid plate, and unique badging. Under the hood of each of the 4Runner’s six trim levels is the same engine, a 270-hp, 4.0-liter V-6 that makes 278 pounds-feet of torque. It is mated to a five-speed automatic transmission and standard rear-wheel drive, with four-wheel drive optional. The 4Runner also offers several different suspension options and upgrades, including a Kinetic Dynamic Suspension that has greater wheel travel for off-roading and an X-REAS adaptive suspension. TRD Pro models get high-performance Bilstein shocks and TRD front springs. Inside, the 4Runner offers seating for five passengers across two rows of seats, with an optional third row available that expands seating capacity to seven. The exterior’s rugged aesthetic carries over to the inside, with large knobs for the climate control and a truck-like dash hinting at its roots. Standard features include an Entune touchscreen audio system, air conditioning, cruise control, Bluetooth connectivity, USB port, HD radio, and a 40/20/40-split folding second row bench. Also available are navigation, dual-zone automatic climate control, leather upholstery, and heated/ventilated front seats. Standard safety features include eight airbags, rearview camera with guidelines, antilock brakes, and electronic stability control. Front/rear parking sensors are optional. 84 of 85 (98%) consumers said they would recommend this vehicle to a friend.